Believers, everyday seeing who we are in Christ seems to just get better and better doesn’t it! 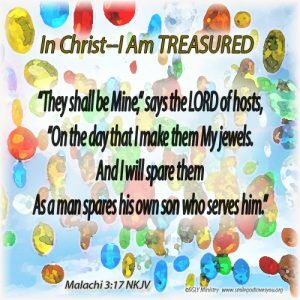 Having the LORD of hosts call us His jewels, which means His special treasures, is such a blessing! We, in Christ, are jewels in the LORD’s treasure chest. We belong to Him, we are His favored, chosen ones whom He has a plan and purpose for. His mercies are new to us every morning and His compassions never fail. We are in His Royal Treasury, we are a most blessed people! Rejoice and give thanks fellow believers, for who you are in Christ!